Never - ever - make a Cold Call again. In countless surveys addressing the effectiveness of sales initiatives –yielding responses from both potential customers and sales professionals alike—both groups agree almost uniformly: the sales pitch they hate receiving (and dread making) most of all is…(drumroll)…the cold call. So why are there still practitioners of this universally-hated method of not closing a sale 98.3% of the time? It sure isn’t the effectiveness rate. So let’s put an end to this outdated, outmoded, abhorrent practice right now. Read on. Inbound Marketing promotes a company through blogs, podcasts, video, eBooks, newsletters, white papers, social media and other forms of Content Marketing which informs potential customers on answers and solutions to needs or problems they may have. This almost passive approach to sales establishes a relationship with the customer who, at a time of his or her own choosing, will be likely to make a purchase of products or services from the company that provides them with the valuable informational resources. Outbound Marketing is, essentially, the “Old School” approach of buying attention via cold-calling, direct mail, radio & TV advertisements, sales fliers, spam and telemarketing. Inbound Marketing earns the attention of customers, while the traditional methods of Outbound Marketing pursue it. 58% of direct mail is never opened. That's a waste of time, postage and paper. 92% of 25-to-34 year olds have clicked out of a website because of an "irrelevant or intrusive ad." While it’s true that Content & Inbound Marketing have been the industry buzzwords for several years now, this should not be construed as a sign that you should be issuing pink slips to your sales staff. Quite the contrary. Like the old song lyric goes, “the leg bone’s connected to the knee bone.” Just as they inform potential customers, effective inbound initiatives should be informing your team of sales professionals, too: maximizing their efforts, targeting better prospects, and warming up those cold calls to a very human 98.6 degrees. Today’s effective salesperson should also be somewhat of a detective. As we all acknowledge, that cold call is probably more of a deterrent in securing business than not. At the very least, it’s certainly a waste of time. With the research capabilities of the Internet at one’s disposal, no initial sales call should be the equivalent of fishing in the dark. 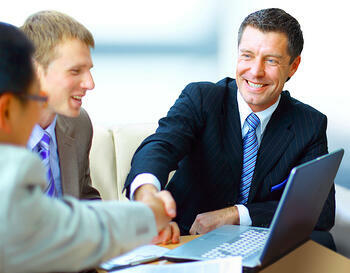 Identifying key personnel at a prospective client company is usually possible simply by visiting their website. By inputting those names into Google, LinkedIn and other business-professional resource sites, much can be learned about point-of-contact executives, as well as the company itself. But what about the completely organic lead? Here’s where an inbound, content optimized marketing platform delivers the goods. If the information resources you provide have been attracting visitors to your site, the technology available “behind the screen” can identify those visitors, monitor the specific pages they visit and the time spent there—thus providing a clear indication of what their interests may be. Sure, we haven’t forgotten the subscribers who signed up on your site either, but these specific lead generations are like watching a consumer peering into a storefront window. Now, if your content marketing initiatives are truly effective –not the random, scattershot affair that plague so many small-to-medium-size businesses—the information you’re providing your prospective customers tells a story in a progressive, serial fashion. As the content leads them down a logical path to the hoped-for inevitable sale, their progress can continually be monitored. Knowing where your prospect is at in the discovery, research and purchase steps along that path allows the savvy salesperson engage them at any one of those steps by providing them with pertinent collateral materials via email or social media. The hard-sell is out. And if attempted, this organic path to a successful sale is more likely to be disrupted. Monitoring the prospective client along the path to conversion allows your sales & marketing team to, in essence, profile the customer-in-waiting. In establishing the “buyer’s persona,” the sales person can specifically address their unique interests and needs as they emerge and evolve, nurturing them ever closer to a sale. And while each individual buyer persona has its own inherent value, over time, a substantial aggregate number of these provides significant data regarding consumer trends, content efficacy and resource value. Life is not a script; nor are normal conversations. When you read from a script, you’re chasing a sale rather than enjoying an opportunity to meet someone new and discovering that you can help them. Pre-screening your prospect –establishing their buyer persona—allows you to take conversations in a natural direction where their needs emerge. Content, and the customer’s context in that stream of information you’ve provided, naturally facilitates a dialogue, free of awkwardness and artificiality. And your prospect will come away with a sense that you’re invested in his or her situation rather than simply attempting to broker a sale. Smart companies and talented salespeople understand that they’re more than what they sell. Every enterprise should be looking to build long-term relationships with its customers. A significant percent of those relationships will lead to referrals to friends, family and associates. And in today’s commercial marketplace, a brand is not built on slogans, promises or, in many cases, even product quality. It’s built on relationships. And the building blocks to establishing that essential rapport consist of information, resources and a bit of good, old-fashioned customer fellowship. So business leader, when next quarter’s sales are flat; when advertising and promotional initiatives have tanked, don’t call your salesperson in on the carpet. Business has changed; the world has changed. Provide your sales force with the new tools required to find and nurture new leads, and build lasting customer relationships. And to the traditional “outbound” salesperson—fear not the new paradigm of Inbound Marketing. If utilized properly, and to its fullest capabilities, your job will never have been easier and, perhaps, never before so successful.